Premium gin perfectly encapsulating the British autumn. An exclusive limited edition release with individually numbered bottles. Botanicals: Juniper, coriander seed, toasted hazelnuts, Seville orange, blackberry leaves, lemon peel, angelica root and liquorice root. Red Leaf Gin is British autumn perfectly captured in a premium spirit. Made with individually distilled blackberry leaves, roasted hazelnuts and Seville orange peel as stand out botanicals. This premium British gin is handcrafted and bottled in Hertfordshire. The full botanical list is: Juniper, coriander seed, liquorice root, angelica root, lemon peel, Seville orange peel, blackberry leaves and toasted hazelnuts. Bespoke artwork created by our resident artist Manasses Machado. Matching front and back labels beneath the removeable bottle sleeve. Sealed with hand dyed wax with easy tear pull tab. Genuine leather tie around the neck of the bottle as a finishing detail. Includes real wood stopper to preserve freshness. Each One Time Gin release is Each bottle is individually numbered after bottling. 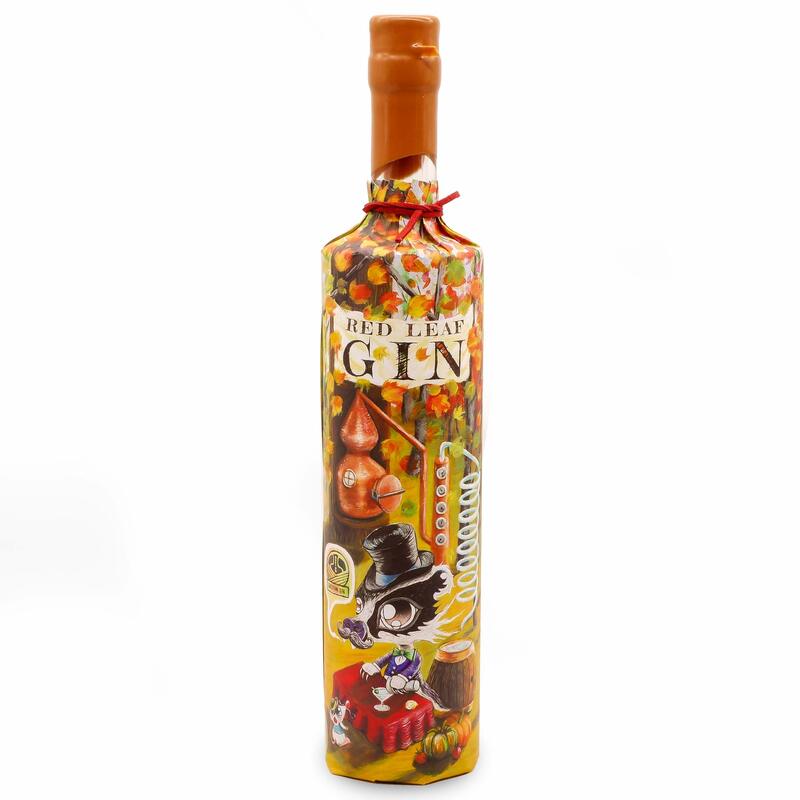 One Time Gin creates limited edition releases in collaboration with the UK’s finest distilleries. We were born with the mission to bring to our community the creative recipes developed by distilleries behind the scenes. Whilst every distillery has their flagship range they sell, this doesn’t mean their creative juices cease to flow. The distillery team are perfecting recipes that ultimately never get a chance to be tried by anyone outside of their inner circle. We exist to change that. Bespoke artwork drawn by resident artist Manasses Machado.